Have you suffered through a severe case of acne that left behind unsightly scars? Long after pimples clear up and the redness and irritation are gone, some of us carry such unwanted reminders. 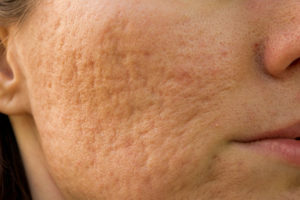 Whether scars are raised or sunken, there are several good ways to mask or minimize them, says dermatologist Amy Kassouf, MD. Acne is a common skin condition affecting about 80 percent of those between the ages of 11 and 30 at some point. It may seem like the irritation will never go away, but it does. And then you can deal with any remaining scars. A dermatologist will first focus on getting your acne under control; the fewer breakouts you have, the fewer scars you’ll get. When your doctor turns attention to the scars your acne has left behind, he or she will typically explore three main treatment options. 1. Laser treatments. Vascular-specific lasers target blood vessels and can help lighten flat or raised scars that are pink or purple, and help flatten raised scars. Doctors often use fractional or carbon dioxide ablative lasers to treat acne scars. Afterwards, the skin is swollen and red, and may bleed, for up to five days, Dr. Kassouf says. Also, you may need between three and five treatment sessions. Doctors use lasers to treat other types of scarring as well — including those from burns, skin cancer and tattoo removal. 2. Chemical peels. Your dermatologist may apply a chemical solution to the skin. This causes it to “blister” and eventually peel off, creating new, regenerated skin that’s usually smoother than the old skin. Peeling usually causes redness, and sometimes swelling and cold sores, for up to seven days, Dr. Kassouf says. This treatment also is less expensive because you typically will need only one treatment session. “Lasers are more precise, so if a chemical peel doesn’t work, people often try laser,” she says. 3. Microneedling. Also known as collagen induction therapy, microneedling uses either a fine-needle roller or pen device to create tiny holes in the top layer of the skin. The procedure stimulates collagen production, which helps improve fine lines and skin texture. Redness occurs afterward, typically lasting a couple of days. Most people will need four to six microneedling treatments for best results, Dr. Kassouf says. Your doctor may use more than one type of treatment, depending on your needs. For instance, he or she may treat some scars with a laser and others with microneedling. When you have damaged skin, no treatment will make it look perfect again, Dr. Kassouf says. But, depending on its severity, an acne scar can diminish by as much as two-thirds after treatment, she says. Teenage patients may have to wait until their early 20s before undergoing treatment to make sure there’s little risk of future acne flare-ups. While acne primarily affects teenagers as their hormones change, many adults develop acne and scarring can result, Dr. Kassouf says. Sometimes when adults lose weight or lose elasticity in their skin as they age, scarring from years past becomes more evident. For other adults, they just find that the time is finally right to take care of themselves, she says. “I had a 60-year-old who said she has dealt with this scar all her life and wanted to do something about it. I’ve seen beautiful results with adults,” she says.